I recently came across an article in the Portland Tribune titled “Neighbors Fear Swales Plan” and was surprised to learn that there was a group of neighbors on 44th Avenue and Seymour Street in Portland, Oregon opposed to a proposed green street near their homes. With so many great examples throughout the City, I erroneously thought all citizens welcomed the enhanced environmentally friendly streetscapes. Well as I continued to read, not everyone is pleased with them. Their concerns ranged from feeling it was not cost effective, to increasing congestion, to creating hazardous waste sites in their front yards. Based on the article, the real crux of the issue seemed to be a lack of communication. I am sure there is more to the story and I hope to interview someone from Portland’s Bureau of Environmental Services (BES) in the near future to learn more about their green street initiative. The situation as characterized by the article underscores how important it is to include public involvement in any project. Despite its many benefits, green infrastructure is no exception. Continued monitoring and research is critical to the adoption and improvement of new technologies. As new stormwater techniques like green streets are employed, dispelling citizen’s fear with facts about their effectiveness and making the case they are a cost-effective techniques as compared to more conventional approaches, goes a long way for wider acceptance. The Tennessee Urban Forestry conference was in town recently and asked Hawkins Partners to give a guided tour of the Nashville Public Square and Deaderick Street. This marked our first “official” tour of Deaderick Street to discuss all of the exciting new aspects of the green street. The renovations to the street primarily focused on addressing stormwater issues and urban trees. The existing streetscape was home to an assortment of unhealthy trees ranging in sizes from 2” caliper up to 24”+. Each and every one of them were shoehorned into a 4’x4’ planting zone and struggling to adapt to urban conditions. The renovations included removing those trees and providing larger and deeper planting areas that would not only give a larger volume of soil for the tree roots, but also provide many areas in which the stormwater could travel to, thus reducing the loads into the storm system. 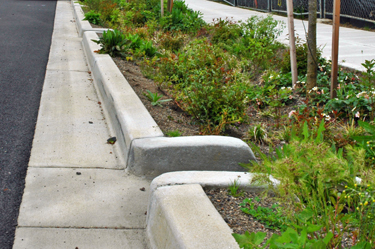 Bioretention zones were implemented in pedestrian bulbs at the intersections and in relation to the existing catch basins. These planting areas were also excavated to a depth that would accept enough engineered soils to allow infiltration and planted with plants that can adapt to the extremes of wet and dry conditions. Pervious area within the corridor was increased by over 700%. The addition of recycling receptacles along the street. We’re hoping that in the near future, permanent retail kiosks that were proposed in the master plan will be added to the street, further enlivening the corridor. Those kiosks are proposed to have an extensive greenroof on each. In addition, the master plan identified areas for future free standing retail buildings and liner buildings that could be added on the blank facades. present graphic panel to Mayor Karl Dean. What SHOULD be green about our city’s infrastructure? Green. These days that one word has many different meanings. Growing up, I could count on “green” being one of the eight colors in a Crayola package, but today, this one word has many more connotations. Being landscape architects, we plan to use this blog as a way to explore “green” in terms of site sustainability issues, with a focus on green infrastructure. So maybe we start with the first question: What SHOULD be green about our city’s infrastructure? When we think about stormwater infrastructure, it is generally conceived of as the complex system that accepts, stores, manages and treats our stormwater. In the conventional designs of the past several decades, this has been done through drains, pipes, curb and gutter and a whole host of devices to hold or detain the water from our bigger storms. With green infrastructure, we look at the potentials of natural systems to deal with those same issues: more interception of stormwater allowing it to evapo-transpire, infiltrate and be held and used for others purposes (like irrigation or flushing water for toilets). This reduces the load on our aging storm pipe system, allowing it to function longer AND it often allows a more cost-efficient solution for the life of the project. Over the past 23 years at our firm, Hawkins Partners, Inc. landscape architects, we have had the opportunity to put this talk into practice having now designed over 500,000 s.f. of green roof, being involved in the first three LEED projects in the State of Tennessee (and many more since then) and incorporating many of these sustainable practices effectively in a number of different projects. We find that our clients like the idea of getting back to natural systems and putting dollars into aesthetically pleasing solutions that also deliver an environmentally sound and cost-conscious solution. Comments : Comments Off on What SHOULD be green about our city’s infrastructure?